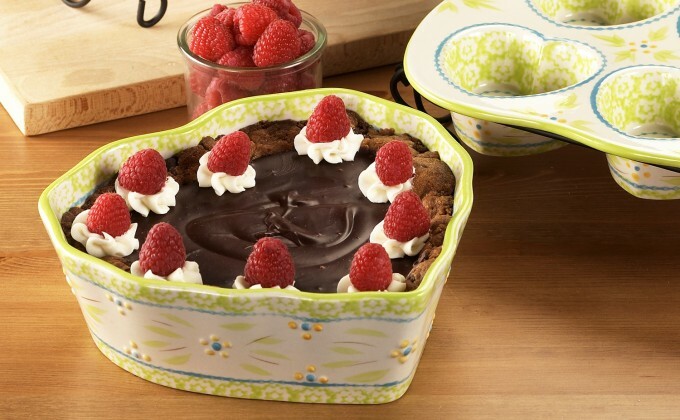 Press cookie dough into the bottom of your temp-tations® 1.5 quart sentiment heart baker being sure to cover the sides about half-way. Let sit for 10 minutes to soften. Bake for 17 - 19 minutes or until golden brown. Set aside to cool completely. Place chocolate chips in a microwave safe bowl. Heat in 30 second increments until melted. Stir every 30 seconds. Once chocolate is melted and smooth, spread over cookie crust, leaving a 1-inch board around the edge. Decorate edge with whipped cream and raspberries.